Swivels 360°. Chrome plated bronze. Spring-loaded snap. Eye: 5/8"Size: 3" L..
Made of marine plastic. 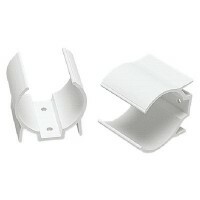 Holds boat hooks, bilge pumps, oars, flashlights, and chart tubes. Stainless.. Ideal for storing boat hooks, mops, gaffs, flashlights, tools and a variety of accessories. All use .. This pad eye folds flat when not in use. 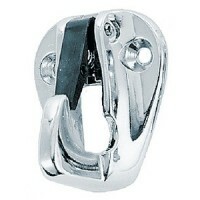 The eye gives with the load; materially reducing the load o..
Quick connect/disconnect system allows you to easily pick up and release your mooring with your boat.. 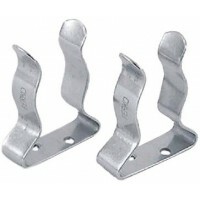 Suitable for awnings, biminis, and many other tie down applications. Working load should not exceed ..
Drop forged steel with hot galvanized finish. Made in U.S.A. Shank: 1/2" x 6"Thread: 3" RegularID: 3..
Drop forged steel with hot galvanized finish. Made in U.S.A. Shank: 5/16" x 4-1/4"Thread: 2-1/2" Sho..
Polished stainless steel. Screw #6 RH. 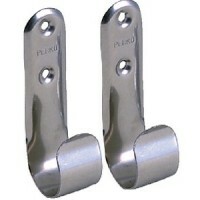 Card: 2Size: 5/8" - 1 1/4"..
Chrome plated zinc. 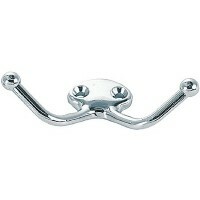 Base: 1-1/8"Fastener: #6..
Polished stainless steel. 3-1/2" long, 1" wide. Maximum pole OD is 1-1/2". Screw size is #6. Pkg. : C..
Non-magnetic 300 series stainless steel. 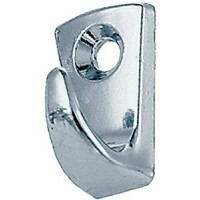 Card: 5Pack: CardSize: 1-5/8" L x 1/4" ID EyeFastener: #10 ..
Chrome plated zinc. 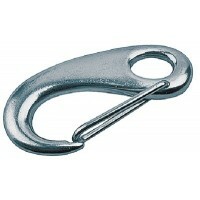 Base: 1-1/4"Fastener: #6..
Non-magnetic 300 series stainless steel. 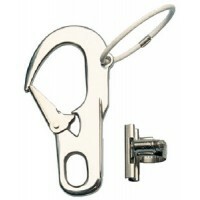 Card: BulkPack: 1-5/8" L x 1/4" ID EyeSize: #10 RHFastener:..
Polished stainless steel. Screw #6 RH. Card: 2Size: 1"- 1 3/4"..
Polished stainless steel. 3-1/2" long, 1" wide. Maximum pole OD is 1-1/2". Screw size is #6. Pkg. 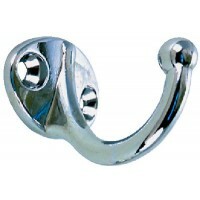 : B..
Chrome plated zinc with interlocking tongue. 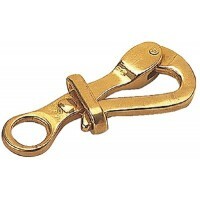 Eye: 5/8"Size: 3" L..
Rope pulleys w/snap hook 2/cd Card: 2Type: Swivel w/1/2" Snap HookLength: 4-5/8"..
Rope pulley 2/card Card: 2Type: Swivel w/1-5/8" eye strapLength: 3-3/4"..
Chrome plated zinc. Base: 1"Fastener: #6.. Cast 316 stainless steel. Pack: BulkA: 4-11/16"B: 3/4"C: 1-1/8".. Cast 316 stainless steel. Bulk. A: 2-3/4"B: 7/16"C: 3/8".. Formed 316 stainless steel. 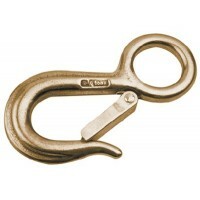 Pack: BulkA: 1/4"B: 2-3/8"C: 5/16"D: 5/16".. Formed 316 stainless steel. Pack: CardA: 1/4"B: 2-3/8"C: 5/16"D: 5/16".. Cast 316 stainless steel. Bulk. A: 2"B: 7/16"C: 1/4"..
AISI 316 stainless steel. A: 5/16"Max.Load: 680 lbs.B: 3-1/8"C: 7/16"D: 7/16"BreakingStrength: 1, 70..
AISI 316 stainless steel. A: 5/16"Max.Load: 680 lbs.B: 3-1/4"C: 7/16"D: 7/16"BreakingStrength: 1, 70.. Formed 316 stainless steel. Pack: BulkA: 5/16"B: 3-1/8"C: 7/16"D: 3/8".. Formed 316 stainless steel. Pack: CardA: 5/16"B: 3-1/8"C: 7/16"D: 3/8".. Cast 316 stainless steel. Bulk. A: 3-15/16"B: 15/16"C: 9/16"..
AISI 316 stainless steel. A: 3/8"Max.Load: 1040 lbs.B: 4"C: 9/16"D: 5/8"BreakingStrength: 2, 600 lbs..
AISI 316 stainless steel. A: 7/16"Max.Load: 1760 lbs.B: 4-3/4"C: 3/4"D: 11/16"BreakingStrength: 4, 4.. Formed 316 stainless steel. Pack: CardA: 7/16"B: 4-11/16"C: 11/16"D: 5/8".. 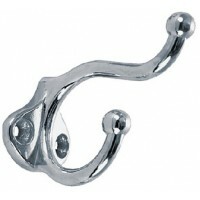 Available in Investmanet cast 316 stainless steel or sand cast bronze. A: 4"B: 1/2"C: 3/8"D: 9/16"De.. 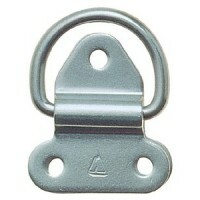 Available in Investmanet cast 316 stainless steel or sand cast bronze. A: 4"B: 1/2"C: 3/8"D: 3/4"Des.. Formed 316 stainless steel. Pack: BulkA: 3/8"B: 4"C: 9/16"D: 1/2".. Formed 316 stainless steel. 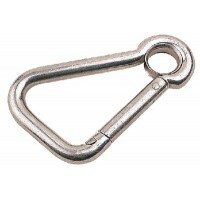 Pack: CardA: 3/8"B: 4"C: 9/16"D: 1/2"..
316 Stainless steel. 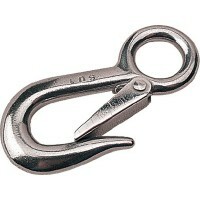 Provides for the secure attachment to lines for use on safety harnesses, fishin.. Sand cast brass. 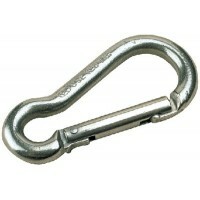 Pack: BulkA: 2-1/8"Size: 0B: 1/4"C: 7/16".. Sand cast brass. Pack: BulkA: 2-7/8"Size: 1B: 5/16"C: 5/8".. Sand cast brass. Pack: CardA: 3-11/16"Size: 2B: 1/2"C: 3/4".. Sand cast brass. 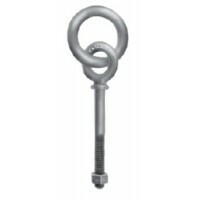 Pack: BulkA: 3-3/16"Size: 1B: 3/8"C: 5/8".. Sand cast brass. 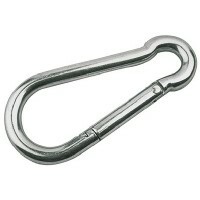 Pack: BulkA: 3-11/16"Size: 2B: 1/2"C: 3/4".. Sand cast brass. Pack: CardA: 2-11/16"B: 7/16"C: 1/2"..